I’m not a fan of 3D in principle… I think it’s a gimmick that adds nothing to story or character and diminishes the cinematic art rather than truly expanding its possibilities. Regardless of my opinion, I’ve noticed many theatrical releases originally presented in 3D are now being released in 2D and 3D versions on Blu-ray. 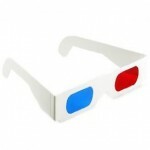 While they don’t come with, or work with, the same type of clear 3D glasses now used in theaters (the kind Elvis Costello might enjoy wearing), they do ofter the same 3D stereoscopic effect in a home theater setting. The 2D and 3D versions are often being featured on the same Blu-ray disc (both in 1080p) and it will be interesting to see if the popularity of 3D theatrical movies translates to more Blu-ray titles being offered in this format. As of now, only a few exist (look for Coraline, Polar Express, Journey to the Center of the Earth and a few other UPcoming titles). However, soon the real movers and shakers in the 3D arena (Real 3D, for instance) will be experimenting with Blu-ray… not only a boost to their own revenues, but also as a possible boost to the faltering high-definition disc format. Blu-ray’s popularity still remains in the long shadow of its older, standard-def sibling, but 3D may provide the extra dimension to make Blu-ray a more popular format with even low-end home theater setups. It’s no secret that Sony and the rest of the Blu-ray Disc Founders Group, currently finalizing 3D specs for the Blu-ray format, hope that 3D will increase sales of both players (the loss leader) and discs (the money train). It’s also worth noting that Blu-ray players with built in 2D/3D capability (one version/one disc) were announced at various CE shows in 2008 but never really came to fruition… but this time the Blu-ray Disc Association seems quite serious about bringing the HD-3D experience home.